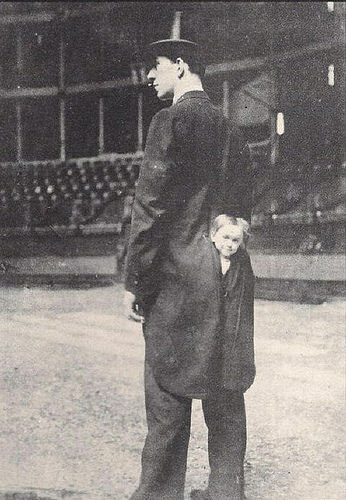 The Hungarian child pickpockets really were the best in the business. Even his youngest son would have to start at the bottom. "How did little Cecil escape from the workhouse, well, thereby hangs a tail." Hi, my name is Michael. I was born in 1871. My mother abandoned me at birth, leaving me to die in the fields in the early morning. Maybe a fox would eat me, perhaps I'd simply die of thirst beneath the hot sun. A she-wolf took me and for months I lived with the pack, struggling for milk and to survive. Somehow I lived. Later, a man found me in the forest and took me from the wolves, my only family, into his circus, where I became a performing freak, oggled by snarling visitors and starved once again of all love and affection. Now, thankfully, this terrible life is over, and I am dead and buried, passed back to the earth. All that survives of me is this photograph. Thank you for listening. "He talks about me behind my back but he's sort of grown on me..."
Children should be seen and not turd. "I used to carry the baby in a carrier on my chest, but that's all behind me now"
Pictured: a young Bernie Clifton. A custody battle that fell between the cracks. Always make sure that you wipe your arse thoroughly to avoid getting kid-marks in your pants. In his fathers eyes Simon had always been a pain in the arse. Nothing unusual here the upper class are always talking out of their arse. "Most intriguing. That would certainly explain all those weird cramps I was experiencing." Mummy please come soon, daddy's head's stuck in the light shade. Little Joey always managed to crack a smile. Its a booty-full baby boy. Boys from the Black Stuff. Jacob is a bairn in the arse.